All the published kilims of this group are woven in a long and narrow format. They were used as divan covers (sedir). In this example – probably the oldest surviving one of its kind judging by its archaic design and light, transparent colours – three jagged medallions linked at their tips take up the light red field. Some authors believe that the medallions represent stretched animal pelts. The rose border, with the “zip fastener” outlines typical of the region, contains widely spaced hexagons filled with stars. – Petsopoulos, Ölçer and Kreissl state Obruk as the provenance of the comparative examples published by them. According to Balpinar/Hirsch and Eskenazi/Valcarenghi, a group of related kilims slightly different in ornamentation is assumed to originate from the town of Akören. The example in the Vakiflar Museum (inv. no. Ko. A. 116) was discovered in the town’s Çarsi mosque. It is believed that the distinctive “animal pelt” design once belonged to the shared design repertoire of a tribal group who lived in different areas, where each community developed its own style. – Several missing areas, corroded brown. Mounted onto a brown fabric. This two-panel village kilim was probably woven in the surroundings of Aksaray. Its heavily patinated colours and archaically simple design of horizontal stripes create an impression of great age. Plain horizontal bands in blue, red, orange, purple and light green cover the ground, some of them separated by narrow, brown dividing stripes. They are superimposed with regularly alternating ornamental bands of two different widths comprising either elongated hexagons or larger, almost equilateral hexagons enclosing double hooks, crosses and stars. The two halves were evidently woven by two different women, as is indicated by several significant differences. The left half is more finely woven than the right on white warps, and the spaces between the hexagons are filled with short and, in some places, polychrome stripes. In the right half, which is woven on wool and goat hair warps, small funnel motifs are seen in the same spaces. – In the early days of kilim enthusiasm, collectors first devoted their attention to Anatolian prayer kilims, or the large-format pieces presenting distinctive medallions, or kilims with dense surface designs. Striped kilims such as this example attracted little notice at the time. Their historic significance as carriers of an ancient tradition and their particular aesthetics have only been appreciated for a very few decades. – Signs of age and wear, missing sections along the sides, incomplete upper finish. Mounted onto canvas. This long and narrow pile rug features an empty, blazing red field and a minimalist border of offset green and red triangles, accompanied by thin plain-coloured stripes. In terms of its coarse weave and the many wefts inserted between the rows of knots, the structure of this rug resembles Persian gabbehs; however, the soft and glossy wool as well as the wide flatwoven selvedges indicate that it was made in the Konya region. Originally longer in pile, the rug was probably used as a yatak (sleeping rug). A second example of this rare group has not yet come to light. The Konya used for comparison by Böhmer in the TKF book, obviously influenced by Talish models and with an equally undecorated red field, proves that this compositional concept was known in Central Anatolia, but it also impressively illustrates the high degree of abstraction seen in the Poppmeier example. – Signs of age and wear, original finishes all around, good overall condition. Woven without borders, this red-ground kilim by the Karakecili nomads is probably a sofreh, i.e. a cloth spread on the ground on which food was served. The red, heavily abrashed field – a large empty space except for several tiny scattered symbols (S-forms, diamonds, ears of corn) embroidered in the brocading technique – is bordered at each end by a wide elem of hourglass motifs decorated with double hooks. The stepped triangles in the elem guard stripes are considered a typical stylistic feature of flatweaves from the Balikesir region. – The upper finish and sections of the sides have been rewoven, several minor repairs. Half of a village kilim very finely woven in a horizontal stripe design. The seven wide design bands contain massive double hooks in three different colour combinations arranged in mirror image and creating reciprocal shapes against the ground, as well as two opposing, halved hexagons aligned on the central axis. The design bands are interspersed with plain, light red and aubergine bands flanked by clusters of narrow stripes in contrasting colours. All the white sections are woven in cotton, and the warps are white cotton as well. This leads us to assume that the kilim was made in West Anatolia, possibly the Afyon region. The mellow palette seems a further indication. – Several missing sections and some damage to the sides. Mounted onto canvas and attached to a wooden frame. Woven in a long and narrow format, this light blue-ground kilim is a divan cover (sedir) from the town of Aksehir in Central Anatolia. It is very finely woven in remarkably attractive pastel shades (aubergine, light brown, olive). The precisely drawn design – an elongated hexagon at the centre of the field and two huge, tower-like shapes facing each other along the central axis – is conceived as a mirror-image composition. Small hexagons, diamonds divided in two by colour change and blossoms composed of four stepped polygons fill the spaces along the sides. 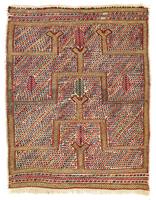 The three primary motifs and the surviving remains of the vertical borders, the inner sides, show the “zip fastener” outlines characteristic of some kilims from the Konya region (e.g. Obruk). A comparison with three other published examples, where the design appears more compressed and the colours are less subtle, indicates that the Poppmeier kilim is considerably earlier in date and probably the oldest surviving example of the group. – Several missing areas, the vertical borders have not survived. Mounted onto canvas. A gorgeous kilim woven in subtle pastel shades in a harmonious composition. The field design consists of seven wide horizontal panels with lateral parmakli outlines. Alternating in ground colour between salmon, azure and sea-green, they each contain a row of five large, immaculately drawn gülbudak designs. The panels are separated by white-ground horizontal bands decorated with a wavy vine bearing carnations. The elems are narrow, brown-ground bands of hexagons enclosing stars and small cross devices. – Our attribution of this large example, very finely woven in a single piece, is guided by Petsopoulos who assumes the Yozgat-Tokat region of North Anatolia as the provenance of a kilim that compares well. – Various missing areas. Mounted onto canvas. This small flatweave represents a particular, highly memorable type which is well-documented in literature. The design in subdued colours has been brocaded onto the ivory wool plain-weave ground. Two flat stepped arches traverse the entire width of the field. They are embedded in a dense basic design of tiny S-motifs. The strictly symmetrical composition derives an ascending movement from the stepped arches. Each of the arches is crowned with a Y-form bearing a small cypress. Two further cypresses are seen in the compartments on either side of the upper arch. In Anatolia, the cypress is regarded as a tree of eternal life and encountered in many Turkish cemeteries. In rugs and flatweaves it is used as a transitional symbol. – Good condition, patinated due to age. This large single-panel kilim was made by members of a Karakoyunlu tribal group who probably lived in the area between Konya and Nigde. Its rich and luminous colours, extraordinarily fine weave and precisely drawn, generous field design make it a striking example. – Three tomato-red horizontal panels are almost completely filled by a white-ground double niche with parmakli outlines and three lateral arms. Each encloses an alternately blue or green double niche of analogous shape surrounded polychrome S-motifs. The sections of the field are separated by brown dividing stripes showing somewhat smaller S-motifs. The field is bordered by wide elems of four horizontal bands which differ in ornamentation. Lateral borders are not encountered in this type. – The Karakoyunlu Yürük, a tribe who had immigrated from Central Asia as early as the 11th century, lived both in the Afyon-Kütahya region and in the area east of Konya. The published comparative examples show different versions of this composition which is typical of the tribe. The example published by Cootner/Muse from the McCoy Jones Collection in the Museum of Fine Arts, San Francisco, is most closely related to the Poppmeier kilim. – Slight signs of age and wear, corroded brown, minor repairs, good overall condition.